No Rain Gutter Should Be Without Them! In a heavy downpour, which of these two rain gutters do you think will catch more rain? Not too hard to figure that one out, is it? It's easy to see why solid gutter covers reduce rain gutter efficiency. Both products keep out leaves and debris, but STEELCO premium gutter screens allow the gutters to work at near maximum efficiency, no matter how hard it rains. And STEELCO™ screens are far less expensive. Please share this information with your rain gutter specialist. Gutter Screens or Gutter Covers? 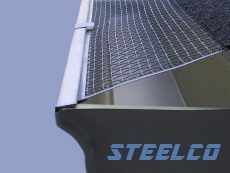 STEELCO premium gutter screens have significant advantages over competitive products. The solid gutter cover products are over-priced, under-performing alternatives to STEELCO screens, which have been proving their value in reducing gutter maintenance for over 60 years. The primary function of a gutter protection system is to prevent the downspouts from getting clogged, and to reduce the need for gutter servicing. "No-clog" doesn't mean "no-maintenance". Despite the marketing claims by some companies, no product will make your gutters 100 percent maintenance free forever. The only way to do that is to seal the gutters completely. But, then, you may as well not even have gutters. While leaf guards of all types can reduce the need for gutter servicing, some roof grit, small debris and fine bio-material will eventually accumulate in the bottom of your gutters. This is perfectly normal and unavoidable. Whether or not they need cleaning is an individual preference. It's getting hard to keep up with all of the Johnny-Come-Lately's in the gutter protection biz. But, from what we've seen, we believe that STEELCO premium gutter screens offer the most practical, sensible and cost effective solution to preventing clogged gutters and reducing the need for gutter maintenance. With that said, there may be circumstances where solid cover products may work just fine, such as homes with very low-pitch roofs, without basements, or homes not prone to puddling around the foundation. If these conditions apply to you, and you just feel like you need to pay more for your gutter protection, then you may want to consider expensive solid covers. APCO Industries, a respected contractor in Columbus, Ohio, recommends sticking with traditional gutter screens. Good advice. And no gutter screen in the world compares to superior STEELCO gutter screen quality and performance. Posted on September 17, 2013 by keith powers. Wear golashes in the rain and put on your shoes at the office.